We are looking for companies or individuals who would be willing to donate $6,000 to provide 1,000 books for first responders in their communities. Information about the donor will be printed on the back cover. If interested, please contact Larry Coppock (615-620-7261) (lcoppock@gcumm.org). 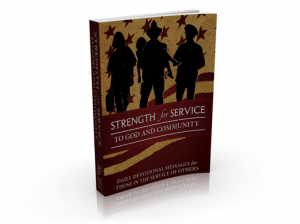 Strength for Service to God and Community is a book of daily devotions for police officers, firefighters, healthcare workers and other first responders. The new book is patterned after Strength for Service to God and Country, a book of daily devotions first written for US troops in World War II and the Korean War, and updated a decade ago. Strength for Service to God and Community, the companion volume, is written for men and women who rush into situations where others are running the opposite direction. The Rev. Dr. Daniel Tackett, director of the International Police and Fire Chaplains Association said the book will become an important tool for his chaplains. Sometimes these highly trained people can draw a blank during high stress/trauma situations. . . The book is a tool to help the mind, soul, and spirit find peace. L.W. Smith, a layman from South Carolina who led fund-raising efforts for the republication of the World War II book, chaired the taskforce creating the new organization. I hope fire fighters, police officers, EMT workers and other first responders will also find the new book as helpful as military personnel found the 50-year-old volume to be, said Smith. These first responders may not receive combat pay, but they risk their lives and they know firsthand about major injuries and death. This book will address their daily situations. This book, like the first volume, is intended to be given free to local fire stations, police stations and hospitals. Churches, foundations, corporations and businesses may want to provide the funds in order to make these books available to first responders.